From the POV of the head, let's say that it reads at speed \$v\$ (the magnetic medium scrolls at speed \$v\$). But looking at the right wheel, which is the one that's pooling the magnetic medium - its radius is growing(!) over time. I don't think that's true. What is really going on here? Radius is growing over time, for sure. I also assume that \$\omega\$ is constant. so did \$v\$ increase? The details of how a cassette drive works are well covered by this Wikipedia article. The tape is pulled by a capstan next to the playback head, and this capstan pulls the tape at a steady rate. You probably need to click on the picture to see it full size. I have indicated the capstan by a red arrow. The take-up spool doesn't rotate at a fixed speed. It uses a slipping drive, as badjohn says in his answer, so it takes up the tape at the speed the capstan moves it. 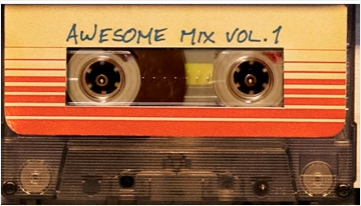 The specific mechanisms for cassette players and decks largely depended on how much you paid for them. On inexpensive players, the capstan, feed reel and take up reel would be driven by the same motor, connected by belts. On the best decks, the capstan and the reals would each have a separate motor. Mid priced decks could have two motors, one for the capstan and one for the reels. On a one or two motor system there would be a slip mechanism driving the take up and feed reels. The feed reel need to put reverse pressure on the tape to maintain tension across the heads. The clutch that allowed the reels to turn at variable speeds could be a simple as letting the belt slip on the pulley. I saw a number of these when disassembling broken players as a kid. On three motor systems, the reels would be driven in the appropriate direction by its own motor. Presumably it was a relatively low torque motor so it would not stretch the tape. Either way, the rotation of the capstan, pressing against the pinch roller would govern the speed of tape travel. The 1 7/8 inch per second speed was the standard, but some players could play at other speeds, usually to extend the recording time for low fidelity used, such as voice notes. During fast forward or rewind the pinch roller is pulled back from the capstan. On a one motor system, the capstan would spin at a faster rate. On a multi-motor system the capstan would be still. Auto-reverse decks added more mechanisms and had two capstans and pinch rollers. The speed past the head is constant: 1⅞ inches per second. A slipping clutch allows the take up reel to vary its speed as required. The reason you are getting confused, is that you are under the impression that the speed of the tape is controlled by the motion of the supply and take-up reels. This is not correct. The speed of tape travel (v) is controlled by the "capstan," which has a constant radius (r) and constant rotation (w). Therefore, v is constant! The very early cassette players did not have capstan drive. The tape was driven from the takeup spool. As a result, the speed of the tape did vary. That was not a major problem as long as you record and playback on the same device. The device was meant to be cheap, not high quality. 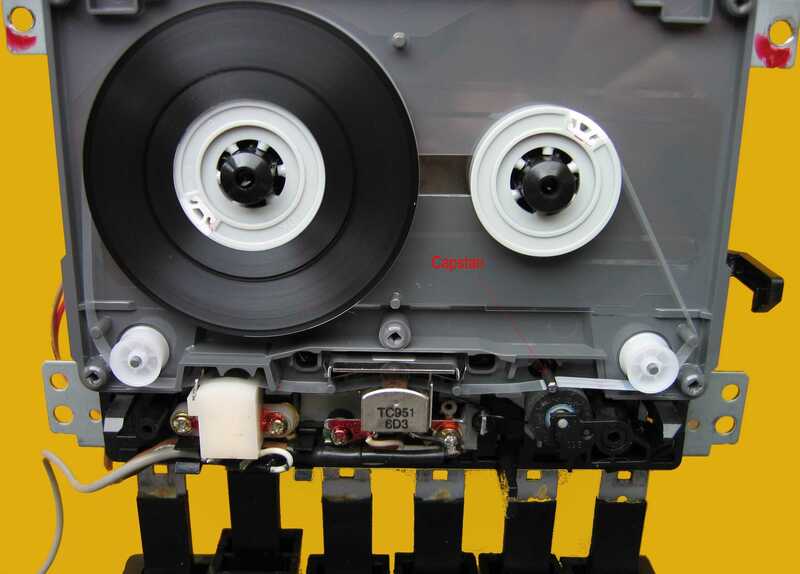 Later cassette devices, driven by the high fidelity craze of the 1960's, incorporated capstan drives that maintained a constant tape velocity over the record/playback head, as previous responders have noted above. That made tapes portable from one device to another. The cassette drive manufacturers would try to outdo each other with wow and flutter specifications, and the devices became more expensive. I just trashed mine because the rubber rollers and belts inside are shot and there are no replacement parts available. Not the answer you're looking for? Browse other questions tagged motor music or ask your own question. What kind of DC motor is this and what does the circuit do?